James Cole in Asia Editor's Picks Travel on 29 October, 2017. It is rare for taxi drivers in India to refuse fares from foreign travellers. The job may lead to communication breakdowns and directional mishaps but the incentive of a ‘tourist rate’ and a hefty tip seem too good to refuse. This is until you ask for a ride to Wagah, the final frontier between India and Pakistan. Armed with a visa and a friend’s phone number, I wasn’t going to give up on my plan to cross one of the world’s most contested borders. Just 50 km separate the neighbouring cities of Amritsar and Lahore. Yet the journey couldn’t seem more convoluted. After multiple cab rejections I adopted a new tactic, resorting to ‘Ola’ (India’s local Uber equivalent) to book a cab with the intent of subtly changing my destination whilst on route. Naïve of course to believe this would achieve the desired effect, we pulled over to the side of the road and negotiated. The car full of petrol for an end-of-the-world-esque expedition and my wallet 1000 rupees lighter, we set off towards the border. As my driver fearfully pointed out the last tollbooth in India, the shops and houses disappeared and we continued through the deserted countryside. Still several kilometres from the end of the road, the seething queue of trucks waiting to cross was building up. Despite the enormity of the two neighbours’ populations, just 200 containers can be exchanged per day with the wait for security and customs unsurprisingly lengthy. I could only hope my ordeal would not be as long as theirs. If the reluctance of the taxi drivers to take me to the border wasn’t enough, their sheer disbelief that I would in fact be able to simply walk across should have done more to deter me. Having built up quite a bond on the journey out (and eager for a return fare), my driver insisted on waiting for up to an hour so I could have a lift back into town when my passport was rejected. Phone numbers exchanged, I embarked on my four-hour bureaucratic marathon. The reason as to why less than 10 international travellers cross the Wagah border per day quickly became apparent. Whilst officials on the Indian side seemed somewhat amused by my intent to cross over to enemy soil, the greeting I received in Pakistan seemed far from friendly. As you stride across the parade ground (the site of the daily ceremonial standoff) the uniforms turn darker, the beards thicker and the glares harsher. Relieved that the lady stamping my passport chose to crack a joke about my resemblance to Harry Potter, I thought that I might be in the clear. A man I’d unknowingly shaken hands with in the queue now ushered me to one side for a ‘chat’. 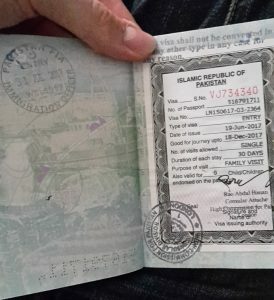 Proud to receive an entry stamp on my Pakistani visa. tion centre, I was forced to complete the last part of my journey on the back of a colourfully decorated ‘Little Train’ that wouldn’t have looked out of place in a European beach side resort. Whilst the crossing itself seemed fraught with complications, the significance of being able to travel between such opposing nations took time to sink in. With the 70th anniversary of Pakistan and Indian independence still fresh in many people’s minds, a great deal has been done to explore the ongoing grievance surrounding partition. Divided by Radcliffe’s seemingly arbitrary line in 1947, the two neighbours have fought three wars and still maintain terrible relations mostly owing to territorial disputes over Kashmir. 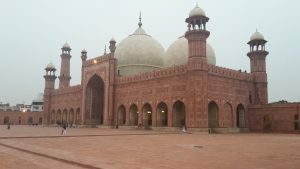 Despite the geographical proximity to Delhi, Islamabad is much more closely allied to the Arab world centred in Riyadh than its predominantly Hindu neighbour. The break-up of Punjab certainly highlights the absurdity of the situation. Unified by a common language and culture, the cities of Amritsar and Lahore would undoubtedly have amassed into a vast conurbation had the line not been drawn. The separation has of course wedged a far greater divide between the two. 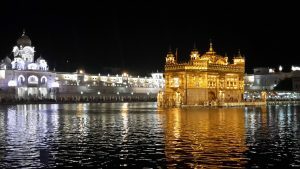 As Lahore’s population and economy has exploded turning it into one of Pakistan’s largest cities, Amritsar has undoubtedly suffered from the lack of trade with its current success largely due to its significance as a sight of Sikh pilgrimage. But from a global perspective, Pakistan is still often viewed as India’s less prosperous relation. With a less vibrant economy, political instability and a debilitating terrorist threat, the country has been largely overshadowed by India on the world stage. The run up to this year’s Independence Day, which I was fortunate enough to witness, provided a good snapshot of the situation. In comparison to the celebrations in India, which are held a day later to mark the liberation from British colonial rule, Pakistan chooses to commemorate the day it gained independence from India. Aided by the political carnage surrounding recently deposed Prime Minister Nawaz Shariff’s march from Islamabad, the immense patriotism was impossible to miss with green and white crescent and star flags trailing from every vehicle. As it was apparently not safe enough to leave the guarded housing society, we watched as simultaneous news stories showed emotive Independence Day speeches and the latest suicide bombing in Quetta. I feel lucky to have had the opportunity to spend time in both these opposing nations. Given all the negative press surrounding Pakistan’s insecurity, I wanted to return dismissing this as media misinterpretation. Whilst the friends I stayed with couldn’t have given me a better insight into this wonderful country, I now appreciate some elements of truth in my Amritsari taxi driver’s scepticism.